Standard Collectible Series Richard Petty Historical Race Plate™ features exciting reflective graphics, driver's number and signature, NASCAR® logo, specific state name and state outline, and driver's name printed in main body of license plate. 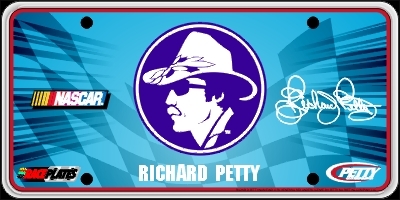 RICHARD PETTY NAME AND/OR LIKENESS USED UNDER LICENSE BY PETTY MARKETING COMPANY, LLC. Create your own plate by adding your text to the plate shown above. Customizing plates is easy, simply enter up to fourteen (14) characters in the box below and hit "Customize It." An additional charge of $9.95 is applied to each personalized plate. Please allow two weeks additional shipping time for personalized Race Plates™. Actual font may vary slightly from illustration due to differences in computers and software. Race Plate Marketing, LLC reserves the right to refuse any personalization requests. Collectible Series Race Plates™ are souvenir plates and should not be used in place of legal registration license plates.